In the summer of 1975, I was blessed with going for the first time to the Garden of the Mother of God, Mount Athos (Agion Oros). I visited various age-long monasteries; I paid my respects to many of the priceless treasures of the Holy place, that is, holy remnants of martyrs and saints of our faith as well as holy icons. I participated in the daily all-night long masses which are concluded with the Divine Service early in the morning. I sat at the simple monastery table, where everything reminds you that you eat in order to survive and fight for your salvation and you do not live in order to eat, where the reading of the devout patristic text aims at transporting the minds of the table companions to heaven. I associated with conscientious monks who, inspired by the divine love and obeying the urging of Basil the Great, “take care of thy self”, have denied the world, but not man for whom they pray unfailingly with love and “with many tears” (Act. 20:19) in their cells and the church during the sacred vigils. During my visit, I did not succeed, despite my wish, to meet Elder Paisios who was then an ascetic at the Stavronikita cell of the Holy Cross. This came later, “when the time was mature” (Gal. 4:4). What I realized about this full-of-grace person during my first pilgrimage to Mount Athos were the characteristic words of another co-pilgrim, today an assistant professor at the Medical School of the University of Thessaloniki, who had met him and told me that “his love breaks you apart”, something I verified myself later on. I will deal with this genuine man of God briefly, as I had the opportunity to do in the past with my dear spiritual fathers, Elder Porfyrios and Elder Iakovos Tsalikis. 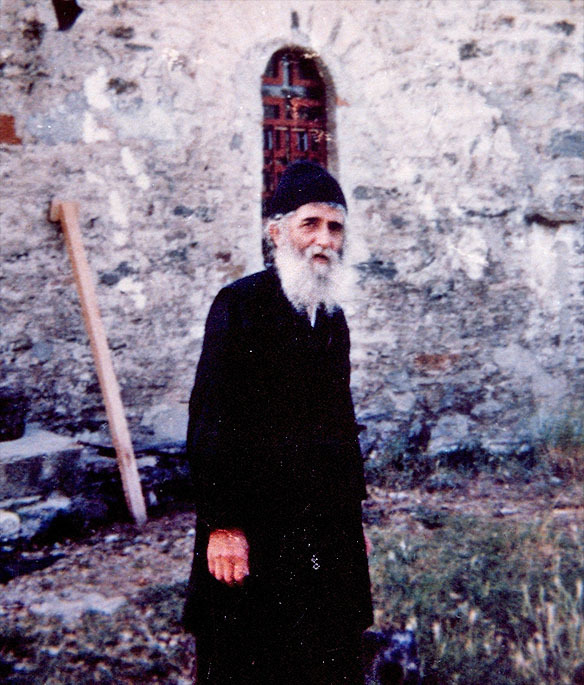 On Tuesday, July 12, 1994 , the late Elder Paisios, the Hagiorite, rested in the Lord, at the Holy Cemetery of St. John the Theologian, in Souroti of Thessaloniki. This genuine man of God, whose secular name was Arsenios Eznepides, was born to pious parents, Prodromos and Eulabia, at Farasa, Cappadocia on the 25 th of July, 1924. Due to the extraordinary and harsh conditions, he was baptized a few days later at Farasa, on the 7 th of August, by St. Arsenios Chatziefentis and was given the name “Arsenios”. Barely a month after his birth, he was driven along with his parents, relatives and other citizens of Farasa away from his paternal home and became a refugee. The boat with the refugees arrived in metropolitan Greece on September 14. 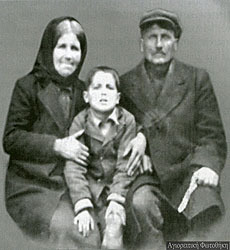 The Elder’s family lived for a little while first in Piraeus , then in Castro of Corfu and in a small village near Igoumenitsa prior to settling down in Konitsa in 1926. He finished the Konitsa Elementary School and, then, he worked as a carpenter until 1945 when he was enlisted in the army. His military service, during those unlucky years of the civil war, lasted for approximately four years, until 1949, when Arsenios Eznepides, the radio operator, received his discharge certificate marked with “excellent” conduct. In 1950, he went to Mt. Athos aiming at realizing the dream of his life; that is to receive the angelic schema. In 1954, he was tonsured at the Monastery of Esphigmenou where he was serving as a novice as a rasophoros monk with the name of Averkios. In 1956, he was tonsured to the “Small Schema” in Philotheou Monastery taking the name “Paisios”. In 1958, after being asked by the people of Konitsa who were spiritually in danger by a “raid” of Protestants who had managed to proselytize eighty poor families, he went to the Monastery of the Theotokos Birthday, at Stomio, next to the Aos River. He stayed there for four years and greatly helped the inhabitants of the area who visited the Monastery. 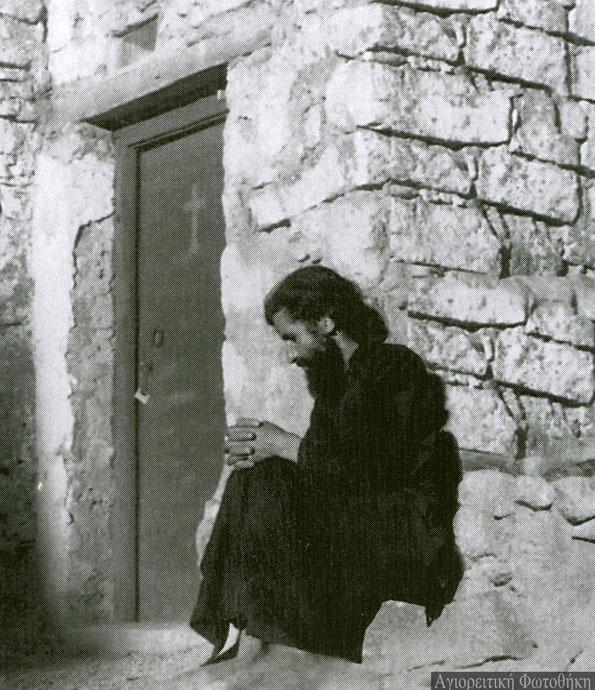 In 1962, we find him as an ascetic at the Cell of Saints Galaktionas and Episteme, in the desert of Mt. Sinai. In 1964, he returned to Mt. Athos and took up residence at the Archangels’ cell, at the Scete of Ivira. 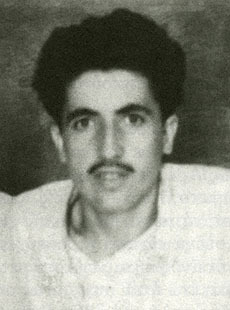 In 1966, he was operated on and had part of his lungs removed due to a serious illness. In 1967, he settled down at Katounakia, at the Cell of Ypatios of Lavra, for more intense discipline. In 1968, Papa-Tychon clothed him in the “Great and Angelic Schema”, at the Holy Cross Cell of Stavronikita Monastery. He remained in the Cell after the repose of Papa-Tychon on the 10 th of September, 1968, and stayed there until 1979. 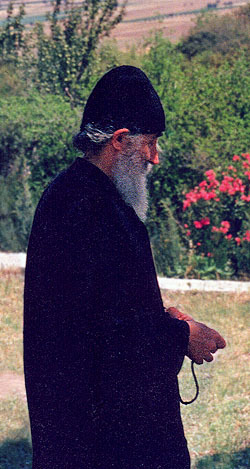 In 1979, he moved on to his final home, the Panagouda Cell of the Monastery of Koutloumousiou, near Karyes. He stayed there until 1993 receiving many thousands of people who visited him in order to share their pain with him and ask his advice and prayer. I was blessed by God to manage to visit him and talk with him during that blessed and fruit-bearing period of fifteen years that he lived in the Panagouda Cell. I remember my eagerness when I went down the path that led from Karyes, the administrative centre of the Athos State , to the Elder’s cell. The sweet expectation of my meeting with this true man of God flooded my heart and gave wings to my feet. The waiting in front of the yard’s gate at the Cell was short or long depending on the case. The Elder took good care to “make this waiting sweeter” having always in the Cell loukoumia or other sweets and water to offer to the pilgrims. The inscription written by him “to eat is a blessing” is characteristic. Apart from all the above, there were also makeshift seats so that the waiting pilgrims could rest and various articles of clothing to be worn by them so that they would not get cold as they were sweaty. Such affection, such love, such providence for everybody! This entry was posted in 20th century Saints, St. Paisios of Mount Athos.